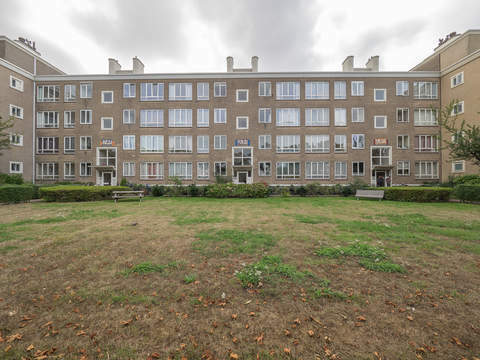 Galileistraat 159 Price asked € 375.000 k.k. In cozy street with front gardens, between the Edison- and Marconistraat, in Neo-renaissance style, 6 room double upper house with modern bathroom and indoor storage. Located near all facilities and Emma Park. Entrance via front garden, stairs to first floor with landing and blue tiled toilet. Front room approx. 2.40 x 2.09 with original ceiling. Bright living/dining room approx. 11.70 x 3.75 with fireplace with electrical fire and bay window. Neat kitchen approx. 3.13 x 2.09 partly 2.69 with white high gloss kitchen unit and various loose equipment, walk-in cupboard and access to a sunny balcony approx. 1.02 x 2.58 facing west. Landing with skylight, fixed cupboard with position for washing machine and dryer and access to the front room approx. 2.33 x 2.09 with open cupboard and paneling. Hallway approx. 1.70 x 2.31 with access to spacious light front bedroom approx. 4.79 x 3.75 with doors to sunny front balcony facing east. Between located attic room approx. 2.31 x 2.02 classify as storage room, light rear bedroom approx. 3.58 x 3.18 with cupboard, modern spacious bathroom approx. 3.28 x 2.08 with walk-in shower, nice bathroom cabinet, toilet, designer towels radiator and fixed cupboard with position of central heating system. Association of Owners will be activated. Electricity 4groups with circuit breaker. The condition of the bathroom is good excellent and the kitchen is good. The apartment has synthetic and wooden window frames with partly single glazing and partly double glazing. Part of the conservation area of the village or town Valkenboskwartier. Living surface approx. 133 m². The volume of the apartment approx. 504 m³. Shops on the Fahrenheitstraat, Weimarstraat, Center/The Hague city center. Sports facilities, public transport, (RandstadRail line 3, tram line 11, 12, bus 24, 21), main roads through the Hubertustunnel. European School of The Hague, elementary schools and various sports facilities such as tennis, football, hockey, horse riding and handball. Bosjes van Poot, Harbor of Scheveningen, beach, dunes and sea by bicycle distance.